Why are you called Homes For Heroes? In aiding our veterans we want to celebrate war heroes from the past. Each home will be dedicated to a Canadian war hero who will be a role model and an inspiration for the tenant. Where’s the funding coming from? An initial endowment has been made by the McCann Family Foundation and the Canadian Legacy Project to initiate the project and carry the first village to completion. Additional funds will be coming from private individuals, businesses and other organizations primarily through donations of time, products and services. 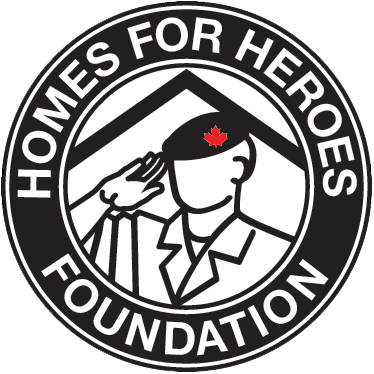 How many homes will be in a Homes For Heroes Village? The size of the land made available, as well as civic site planning regulations, will determine this. We anticipate having 15 – 20 homes on a site. Will the homes be furnished? Yes, all units will be furnished and supplied with cooking utilities as well as all linens. The occupant will be supplied with all requirements for comfortable living and healing. Will there be rules occupants must comply with? The goal of the Homes For Heroes Village is to assist Veterans towards restored lives by offering a safe, secure and comfortable home while professionals work with them towards their restoration. A code of conduct will be imposed by those agencies aiding in their rehabilitation. Who will determine which vulnerable veterans will live in a Homes For Heroes Village? The homes will be made available to The Mustard Seed, a long established and critically acclaimed social agency, to manage and provide the services required. Homes For Heroes is also working in partnership with various social service agencies and veteran organizations to identify veterans experiencing homelessness. Once a veteran has been assessed by the “boots on the ground” team the veteran will be partnered with one of our social agencies. What support services will be available to the occupants? In addition to being provided with a fully self contained comfortable and secure home, our partnering social agencies will work with the veteran to encourage successful growth. Some will be provided with Post-Traumatic Stress Disorder (PTSD) support while others will receive rehabilitation based on their individual needs. When a veteran is ready for employment the veteran will work with our local and national employment service partners. What transportation services will be available? The Homes For Heroes Villages will be located near public transit routes. Bicycle racks will also be provided. Homes for Heroes will partner with businesses and groups to provide exterior maintenance to ensure the village is clean and well kept. Residents will also be expected to participate in the maintenance of the property and tend to the community garden. A comprehensive security system and process will be in place. The security detail will include 24/7 monitored video surveillance, on site security personnel during specific hours, mobile security checks and ongoing monitoring by local authorities.